Saturday mornings aren’t the typical time for press releases to be sent out, but a couple of Saturdays ago, at 8.10am, Harry Potter and the Cursed Child sent a missive to the media. It relayed the news that 1,200 seats for the first previews of the show, would go on sale for a mere $20 each (per part) at 8pm that evening. 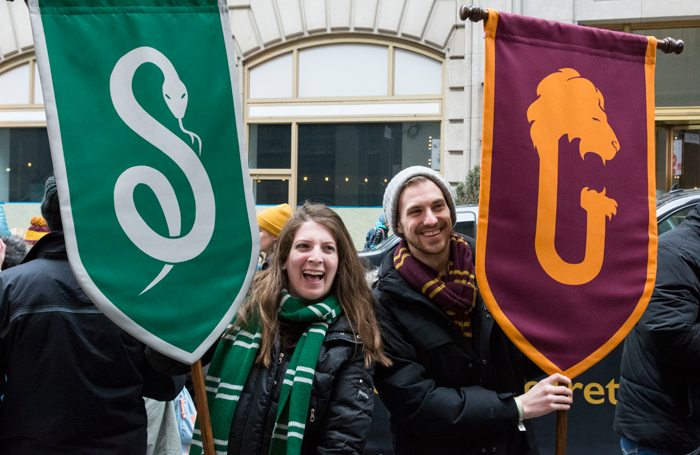 Given the popularity of the Harry Potter franchise, and the show’s success in London, one could easily imagine hordes of fans descending on New York’s 43rd Street and storming the doors of the Lyric Theatre for this rare opportunity. But arriving at the Lyric shortly after 1pm, I found an extraordinarily peaceable crowd, calmly waiting in a designated area in front of the theatre. To those still inclined, numbered wristbands were still available. Yes, word had gotten out, but the mob did not rule. 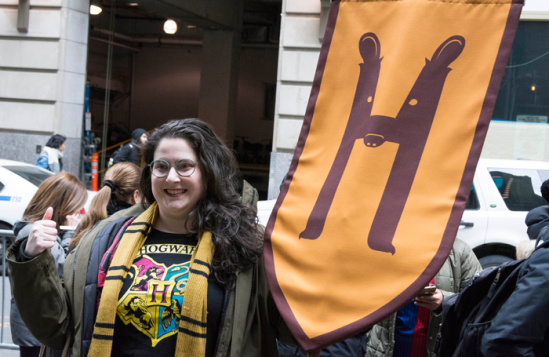 The youngish crowd – most appeared to be in their 20s and 30s – were festooned with scarves and caps signifying their Hogwarts houses, but it was appropriate to the weather as well as the cosplay. 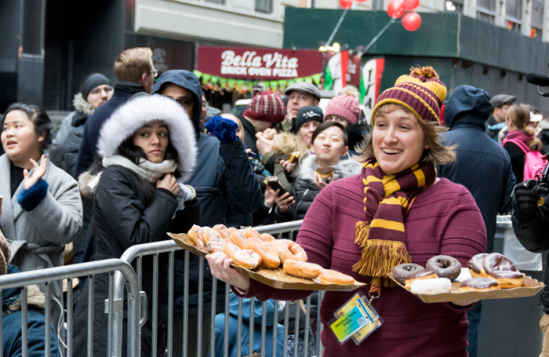 Up and down the sidewalk that ran along the holding pen, event staff ferried seemingly non-stop carts of hot beverages and trays of doughnuts to the waiting faithful, who cheered every arrival. Thanks to the identifying wristbands, people were allowed in and out of place, so no one was denied bathroom breaks or stretching their legs. The production provided banners of the aforementioned houses, which were the basis for many a selfie. A large number of those who had staked their claim were reading, and not just JK Rowling’s bestselling series. 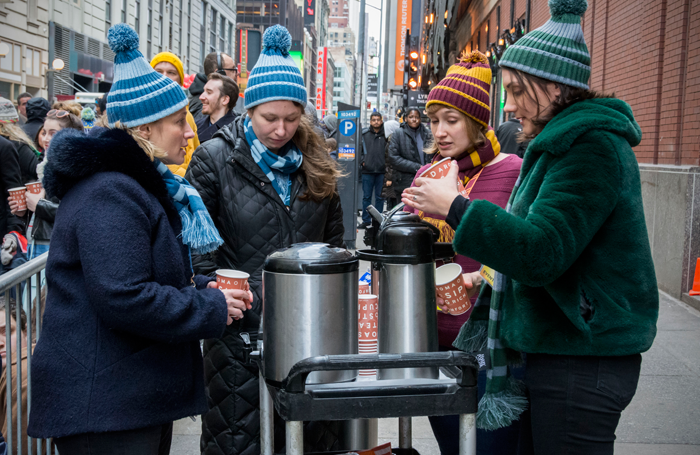 Now the ticket lotteries, which began with Rent and reached their apotheosis with Hamilton, have largely moved online, this kind of impromptu gathering of theatre (and Potter) fans is more unusual. With it’s last-minute, ticket-tout confounding announcement, HPCC assembled a like-minded group who had a good time despite the long wait in the cold weather and were offered a rare bargain as well as sweet treats. Elsewhere on Broadway, another group of the faithful will be gathering, presumably eight times a week, to the St. James Theatre, where the musical adaptation of Disney’s blockbuster animation Frozen has taken up residence. Of course, one must look carefully, because this constituency, while perhaps only four feet tall, are easily spotted in their polyester blue gowns. Last Friday night, there were no fewer than five girls dressed as Elsa, the ice princess whose powers fuel the plot. 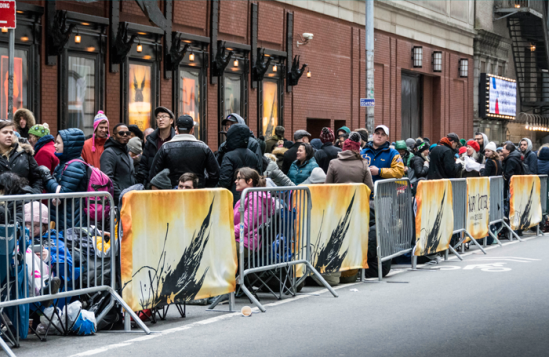 One can only imagine what weekend matinees will be like. But once again, it is heartening to see theatregoers, even the very youngest, displaying their affinity for the story about to be told and signaling to others that they belong to the same club. The crush of a theatre interior doesn’t necessarily afford the best opportunity for an informal gathering, but hopefully, if they stand at the stage door after the show, these small die-hard fans will be rewarded with special positions as they await autographs from Caissie Levy and Patti Murin, the show’s dual princesses. 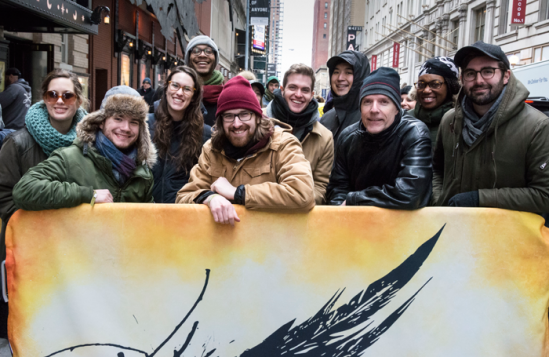 Not every production lends itself easily to these kind of demonstrative shows of like-mindedness – certainly no one wants to be at Angels in America seated next to the person in full seraph regalia, because wingspans are as intrusive as mid-show texting. But these newest entries are reminders of the potential for, and value of, fan service. Giving committed audience members something special for their fandom, be it a bauble or a discount, will surely serve word of mouth while making the experience even more special for those who declare their commitment. And if those Potter scarves are still on display when air conditioning is turned up in summer months, they’ll prove practical and not merely tribal. As for the proliferation of Elsa gowns? Maybe they’ll turn the tide of long-heard complaints that no one dresses up for the theatre anymore. Tony Kushner’s Angels in America returns to Broadway, opening on Sunday, almost 25 years since it was first seen there. Marianne Elliott’s National Theatre production arrives with its cast all but intact, with Andrew Garfield, Denise Gough and Nathan Lane among those reprising their London performances. On Tuesday, Kenneth Lonergan’s Lobby Hero inaugurates the reopening of the Helen Hayes Theater under the auspices of Second Stage Theater, making it the fourth not-for-profit company to have a permanent home on Broadway. First seen Off-Broadway at Playwrights Horizons in 2001, the Broadway cast for Lobby Hero includes Michael Cera and Captain America himself, Chris Evans, under Trip Cullman’s direction. Edward Albee’s Three Tall Women is also making its Broadway debut this week, on Thursday night, having first been seen, and Pulitzer prize-honoured, in its 1994 Vineyard Theatre production. The title triumvirate is played by Glenda Jackson, Laurie Metcalf, and Alison Pill; Joe Mantello directs. Simon Stone’s production of Lorca’s Yerma, first seen at the Young Vic, makes its US debut at the Park Avenue Armory this week for a run of only four weeks. Billie Piper reprises her Olivier award-winning role.